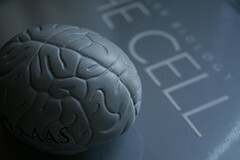 Tag Archives for " Anyting You Want "
One the biggest impediments to small business growth is the owner’s brain. It’s not that the owner’s thinking is flawed, it’s that most of knowledge, mission, vision and basic how to do stuff stays locked up there. Most small businesses expand and contract relative to what the owner can keep their arms and thoughts around. The key, of course, to unlocking this constraint rests in the organization’s ability to document how and why everything is done through the vision and receptors of the owner. This is the only way to growth for most small businesses. Until delegation, without abdication, occurs in a way that ensures a transfer of knowledge, culture and beliefs, chaos is pretty much guaranteed. I think most people get that intellectually, but the hard part is actually doing it. Knowledge transfer isn’t as simple as telling people what to do. When most business owners do something it’s done with the collective experience of having done it many times, in many ways, infused with who they are and what they stand for. We become unconsciously competent at the things we do and struggle to convey the step-by-step components with any level of usefulness. My wife has finally given in to the tech gadget world and explaining what a browser does has proven extremely challenging for me, even though I’ve used one some part of every day since they were invented. Sivers said that the moment he realized that his primary function in growing his business was to teach people in his organization everything – including how to reply to email and sound just like him – his world changed. One of the things he did while growing CDBaby was to learn programming so he could save money and program the code to run to his store. He credits this with equipping him with the skill to delegate, document and transfer knowledge properly. He told me that one of the things you learn with programming is that to create the script to allow, say, a member to log in, took telling the computer dozens of things. The same is true for explaining how to do anything. You must start with why and methodically document the most rudimentary steps. He equated it to telling a robot to get you a beer. First you have to tell it how to walk. I think that’s the case with delegating and documenting. Tell the system why to walk, then tell it how to walk, then it can start deciding where to walk without direction. He told me that every time someone asked him a question about how to do something he stopped and called a bunch of folks together and explained how and why it was done and had them document the session. He admitted it was a painful process, but one that allowed him to get out of the doing so his business could grow. This is how you transfer vision, mission and culture, while freeing yourself to do the strategic work of the business – until everyone in your business can take over your email inbox and respond just as you would – growth will be stymied.